S’mores Cookie Cake -Your favorite campfire snack, now in cookie cake form! The crust is made from brown sugar cookie and graham crackers and filled with tons of chocolate and marshmallow. This dessert is sure to impress kids and adults alike! A few months ago, I told you guys that my older sister moved her whole family up here to Atlanta from our hometown of Orlando, FL. It’s been so great to have some of my family here and to spend more time with my nieces and nephews. Since they moved, we’ve started a tradition for birthdays: on your birthday, you get a personalized birthday cake made by yours truly. They’ve already had 3 since they moved here in August and will have 3 more before the year is up. Needless to say, this time of the year is packed-full of birthday celebrations! The most recent celebration was for my nephew, Chris. He really loved these s’mores chocolate chip cookies that I made for Labor Day so he asked if I could make them into a cookie cake. Of course I could! In fact, I already had a s’mores cookie in my repertoire. This s’mores cookie cake is one of my favorites because of the amazing cookie crust. It’s made with your typical brown sugar cookie dough but with smashed graham crackers added. Those crackers are the key to making the cake taste amazing. You need to make sure not to crush the crackers into crumbs, but rather into small chunks (the size of grapes). That way, you get a bit of cracker in every bite. I made it with crumbs once and you could barely taste the graham cracker. Oh and let’s not forget the gooey center…That’s another amazing part of this cookie cake. Thank you, marshmallow fluff. This isn’t just a cookie cake for kids, folks. I first made this cookie cake for a room full of adults who were over for a barbecue. And they loooooved it. Like I said above, don’t use graham cracker crumbs for the cookie crust. It tastes much better when you break the graham crackers into chunks instead. When spreading the marshmallow fluff over the crust, spray your spatula with a little cooking spray so that the fluff won’t stick to the spatula. When topping the filling with the top crust, you don’t want to cover the filling completely. It makes for a better presentation if you spread the crust to the edge and let the center break and crack slightly. That way you can see some of the marshmallows and chocolate chips poking through. Now this next step is gonna be tough, but trust me…you gotta let the cake cool about 15 minutes before serving. I know, it’s gonna be torture! But the fluff turns into hot lava so if you try to eat it right out of the oven, your mouth will turn to fire. You are going to love this cookie cake! Let me know how yours turns out in the comments below. Your favorite campfire snack, now in cookie cake form! The crust is made from brown sugar cookie and graham crackers and filled with tons of chocolate and marshmallow. Yummmm! Preheat oven to 350 degrees. Grease a 9-inch pie pan with cooking spray or butter. Set aside. Add butter and sugar to the bowl of a stand mixer, fitted with a paddle attachment. Cream together on medium until smooth and fluffy (about 2 minutes). Add the vanilla and egg and continue on low until combined. Set aside while we mix the dry ingredients. Grab graham crackers and place them in a medium mixing bowl. Crush them with a potato masher until you have chunks of cracker the size of grapes. Any smaller that that and you won't taste the graham cracker as much. Add flour, baking powder, and salt. Mix until combined. Add 1/3 of the dry ingredients to the wet ingredients. Mix on medium-low until combined. Repeat with the next 1/3 and then the last 1/3. Cut dough into even thirds. Take 2/3 of the dough and press it into the prepared pie pan so that it is covering the entire bottom, evenly. Spread marshmallow cream all over the dough. This will be tricky since the creme is so darn sticky! To make it easier, spray a spatula with nonstick spray. Sprinkle marshmallow creme with chocolate chips and mini marshmallows, Grab remaining 1/3 of dough and form into a large disk, using both hands to flatten and shape it. There won't be enough dough to completely cover the marshmallow and chips but that's okay. It actually looks better with some of the filling exposed. Sprinkle a few more chocolate chips on top. Bake the cookie cake for 25 minutes until the crust is golden brown and the marshmallow has started caramelizing. Let cake sit for 20-30 minutes until it's cooled somewhat. It is hard to slice when it first comes out of the oven so letting it sit will let the filling harden a bit. I cannot wait to try this! Looks soooo good and for these chilly fall days gots me excited! I can’t get enough s’mores!! S’mores cake? How has this been missing in my life until now?? That marshmallow looks so gooey and perfect! Me either! I don’t care what season it is, s’mores are my favorite! Three of my favorite things all rolled into one delicious wonder?! How is it even possible?! YUM!!! Haha yesssss. S’mores are soooooo good! Seriously, s’mores are my favorite treat. This cookie cake sounds like an absolute treat! I’m definitely going to have to give this one a try. This looks absolutely delicious.. I love cookies!!! Oh, wow! This looks absolutely amazing! I love s’mores, but would never have thought to combine them with a cookie cake!! Yesssss. Cookie cake in any flavor is soooo good! oh my this looks incredible!!!! just in time for Thanksgiving baking!!! Thanks so much! Let the baking begin! Ok, that needs to get in my belly right now! S’mores are totally my jam! Thanks for sharing! My mouth is watering! I just pinned your post so I can make it with my girls later! Yummy! You just stole my heart with this one! Yum!! YUM! 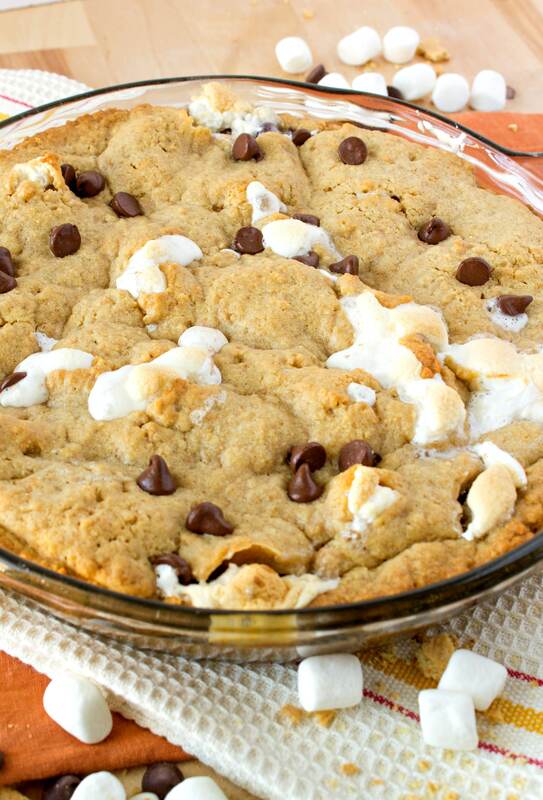 I love any sort of cookie cake, and this variation with the marshmallows looks so perfect. YUM. Everything about this is so perfect and the marshmallow filling looks sooo good! Oh my goodness! This s’mores cookie cake looks AMAZING. You’ve just combined tthree things I love into one! Yum! Oh that looks delicious! You can’t go wrong with chocolate and marshmallows. What a fun twist from regular ole’ cookies! Omg this looks amazing! What a yummy dessert! This looks so good!! YUMM!!! I am craving Smores now. That gooey marshmallow is totally tempting me right now!!! Give in to the ‘mallow! Wow this looks AMAZING. I love cookie cakes, and this one looks especially soft and gooey. Just the way I like it. Yes me too! The gooeier the better! This looks amazing. I love s’mores! WOW, this looks amazing!! My mouth is drooling over these right now. Pinning for later!! Haha can’t blame you for drooling! Yum! This looks delicious! Can’t wait to make it. OH MY GOSH! I could eat this whole thing right now. It looks amazing!!! Ahh This looks amazing! Definitely pinning to make later! Looks so AWESOME!! 🙂 I definitely want to try this cake out. This looks delicious! S’mores are our favorite treat this time of year! Oh my! This recipe looks amazing and delicious. Great idea for birthdays or even upcoming holiday parties. YUM!!! My daughter will be making this, this week. YUM! This wouldn’t last long in my house. Probably have to make two. This looks absolutely delicious! Smores are one of my favorite things ever, so anything smore flavored, I love. But seriously–I know what we’re having for dessert tonight ;). Haha yessss! I’m a s’mores addict too! Love anything gooey! No I haven’t! Is it amazing?? Wow, this looks great! I tried to make something similar to this in brownie form, but the graham crackers got stale and the marshmallows burned. Eek. Thanks so much! You should try a graham cracker crust instead!